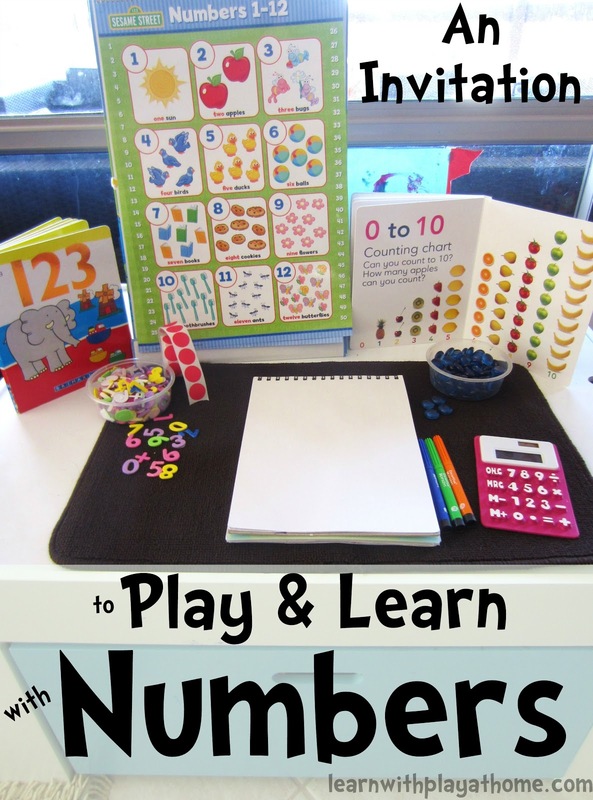 Today's Invitation to Play is designed to encourage young children to learn and explore numbers. Possible outcomes include counting, number recognition, drawing, writing, representation, one-to-to correspondence, manipulation, calculator skills, memory, fine motor and more. My favourite thing about Invitations to Play is that they are open ended. This means that there is no set outcome or end result that must be achieved. It also means that the child has the freedom to work at their own level and ability within their own interests. Materials: (we used) Number books/charts, foam number stickers, dot stickers, glass stones, paper, markers and calculator. You could also use: counters, beads, beans, number stamps, number stencils, deck of cards, dice (and pretty much anything with numbers on it or number/counting/manipulating related) etc. Without prompting she decided to start at the number one and found a foam 1 sticker and then the number 1 on the calculator. "The "1" sticker needs 1 dot sticker to go with it"
I love how she used one-to-one correspondence to place one glass bead on top of each dot sticker. This is a great moment to talk with the child about what they have done and why. Having visual cues is good for children to make and form connections between the written symbol and the amount. They are able to see and count. Having them talk about what they see connects the language that goes with it. Seeing the written numbers (written both in numerical form and the written words) will also allow children to attempt their own writing of the numbers. She spend a long time drawing 3 little people, finding and sticking the number 3 and corresponding one glass bead with each person. Here in this little picture alone are a number of important and valuable skills that have been used. I was so happy to see her representation of the number in a different way. - ﻿Extend this activity by mixing around and changing materials for the children to explore. Provide number charts etc of higher numbers depending on the children's levels. Try adding glue and craft sticks for children to make their own 10s frames (10 beans/beads etc stuck to a paddle pop stick to represent the number 10). You could have these made already and add them in for children exploring larger numbers. Challenge them to use all the materials combined to demonstrate a chosen number representation. Have them teach/show this to their siblings/peers/you. - Assist your child to use materials they may be unfamiliar with like a calculator. Allow them to explore it themselves first and just step in where needed. - Use new language and descriptive words like, "represent" This will help with their language development. - Supervise your child when using small items such as glass beads/stones. My daughter loves playing with the calculator. I often place that on her activity with other office supplies, but putting them with other 'counting' objects is a great idea. I was looking for "quiet" toys awhile back and found that a dollar store calculator was a favorite. :) My son plays with the numbers, and then pretends it is a phone. I think it will be a favorite for a long, long time. Giving her office supplies (carbon paper, hole punch, stamp etc) really just came about because I remember how much I loved going into my dad's study as a child. My niece would love this. I love that we can make activities that might seem like work "fun" now. I wonder how many more girls will like math because their parents and teachers are approaching it differently? Still in love with the Dr. Seuss font. So cute! Deb, honestly, you're amazing! I think Miss Possum will well and truly for school because of all your great ideas. What's worse is that I realised I had never introduced a calculator to her! What a fantastic and fun activity. The hard part will be for me to keep my mouth shut and just let her play with all the resources! I love that this is such a simple idea but can be done in so many ways. It is open-ended and allows children to work at their own pace and feel supported at the same time. Great work. Thanks for posting. I love this invitation, so many fabulous 'things' to play with and explore. My girls love playing with the calculator too....such a great learning tool! A wonderful invitation for fun and learning Deb! I had forgotten all about the beauty of calculators so thankyou for the reminder! Oh Debs, I have a total blog crush on you! :) Love your work, and love this post. Fun with numbers! What a great way to play with numbers and learn!! Awesome book set. Great learing tools. Thanks for linking up to tip-toe thru tuesday. Thanks for sharing on Tuesday Tots! I love this! I'm featuring your post this week on In Lieu of Preschool: http://www.inlieuofpreschool.com/2012/11/must-see-math-on-tuesday-tots-linky.html Feel free to stop by to pick up a featured button. Off to pin your post to the Tuesday Tots board now. Thanks again for sharing!! This is wonderful! Can you tell me which Sesame Street spiral-bound book that is with the numbers page on it please? My daughter is only 22 months but I'm looking out for the right teaching material to introduce in the coming year.